As an author of some status, I find myself besieged by requests from would-be writers requesting advice, looking to network, or asking me to blurb their tiresome efforts. Frankly, I have neither the time nor patience to deal with such requests. I would like to add a manifesto page to my website listing the rules and conditions under which readers may be allowed to contact me. May I? Miss Rosie thinks not. And while she congratulates you on your success as An Author of Some Status, she is troubled by your attitude toward those who are also pursuing their Authorial Dreams. Your missive puts her in mind of a hairy green character from the pages of Dear Dr. Seuss. (You know—the one whose heart was three sizes too small?) Those who reach out to you see someone they might become; they hope to receive Writerly Words of Wisdom and Avuncular Advice from one who has achieved the seemingly impossible. And now Miss Rosie has a question for you: Has no one lent you a helping hand along your Journey? Has no other author offered advice or encouragement? 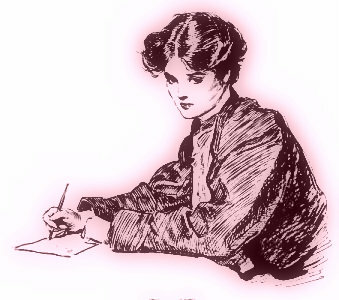 Miss Rosie remembers her own timid efforts in approaching Authors of Some Status, and more often than not, those efforts were received with graciousness. Miss Rosie still has in her possession a manuscript page from a contest in which the darling Miss Kristan Higgins left lovely comments and a Beautiful Flourish in her signature. (Miss Rosie’s receipt of said paper sent her into a fit of Rapturous Vapors from which she still has not fully recovered.) More recently, The illustrious Miss Louise Penny allowed Miss Rosie to indulge in several minutes of Unseemly Gushing and bore it with noble patience and a smile. Fellow mystery author Mr. Brad Parks sent her a congratulatory note after her deal was announced, and none other than Mr. Tom Perrotta—who, while busy adapting screenplays and accepting Oscar nominations and receiving literary awards—provided encouragement at a time when she needed it. And there are many other writers in Miss Rosie’s life without such Illustrious Names who have supported her in her own Modest Efforts, writers who took time from their own projects to help a colleague. It’s called Paying It Forward, Not So Gentle Reader. You might try it yourself one of these days. And who knows? You may just find your heart swelling--instead of your head. I love this post. I'm a member of the SCBWI, and I am always amazed and humbled at how accessible even the most famous authors are to newer, less experienced authors. I owe a huge debt of gratitude to so many who, after achieving success, reached down to me and helped me move a little forward on my own path. It would be an honor for me to do the same for someone else. LOVE it!!!! And so true! Pay. It. Forward. ALWAYS!!!! Stina, Miss Rosie is gratified by by your demonstration of affection. Laurisa, Miss Rose was inspired to write this after hearing that Certain Authors were putting FAQs on their websites that were not, in fact, questions. But rather rules by which readers were dissuaded from contacting them. Tsk, tsk. Richard,Miss Rosie adds her Hearty Approbation. Martha, Miss Rosie is touched by your enthusiasm. And Multiple Exclamatin Points.